Geoffrey Farmer: Detail from The Surgeon and the Photographer, 2009 (paper, textile, wood, metal). Geoffrey Farmer: The Last Two Million Years, 2007, exhibition copy, 2015 paper cut-outs from selected pages of The Last Two Million Years (foamcore plinths, Plexiglas frames, marble, incense). 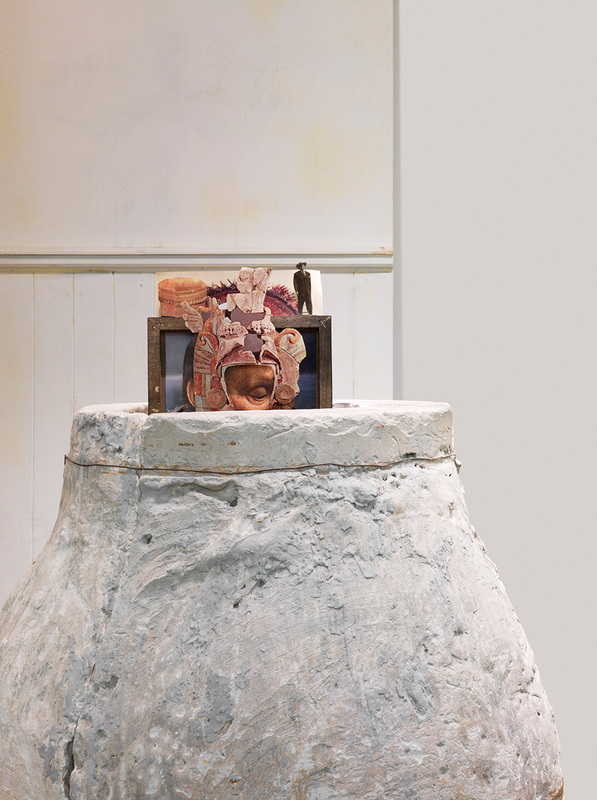 Geoffrey Farmer: We Appear to Disappear, 2012, installation view, 2015 (plaster mould from Cerámica Suro, Guadalajara, found images, mechanical structure). 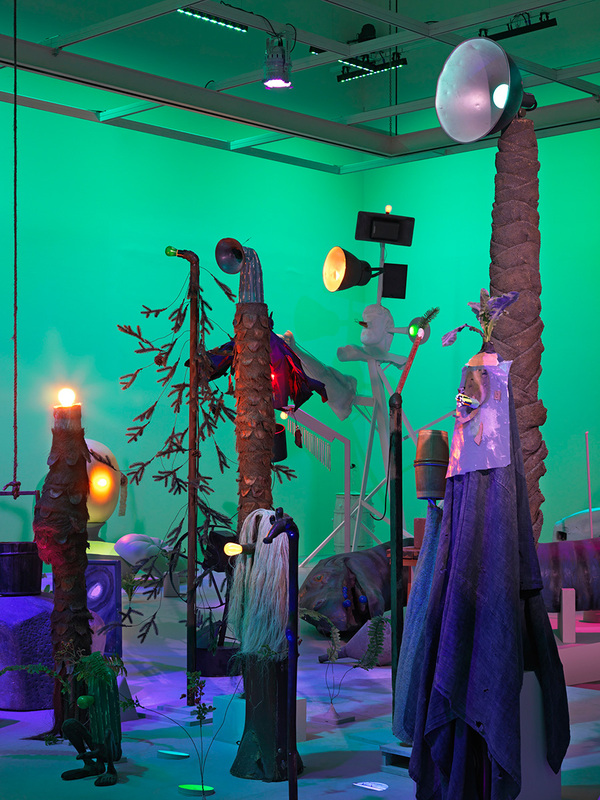 Geoffrey Farmer: Let’s Make the Water Turn Black, 2013–15, installation view, 2015 (theatre and film props, platform, computer-controlled sound, lighting and kinetic system, sound library), written program generative composition by Brady Marks and Geoffrey Farmer. The title of Geoffrey Farmer’s sizeable mid-career survey, How Do I Fit This Ghost in My Mouth?, echoes the libidinal as well as the the haunted, reigning concepts of high postmodernism. The quandary proposed neatly encapsulates a human lifespan, from the earliest oral developmental stage (psychoanalytically speaking) to the ghostly, post-death state. It suggests a beginning attempting to consume an end — an ouroboros. 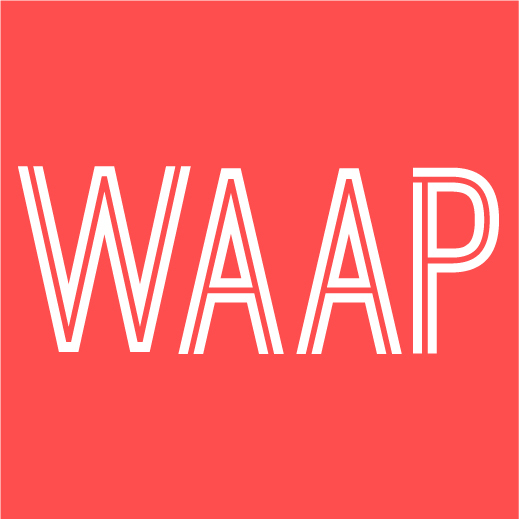 It would sound hopelessly general and, after the massive international recognition of Leaves of Grass at Documenta 13 in 2012, more than a little corny to say that the dominant theme of Farmer’s art is life, but it would not be entirely inaccurate. In his work, a vast array of objects, images, and sounds drawn from varied reaches of human history produce countless moments of synchrony and connection that, to quote the perfectly ambiguous title of one his smaller kinetic pieces, “appear to disappear”. There is a constant tension in his work between organizing principles and the chaos that roils beneath their taut surfaces of imposed order. It is also worth noting that in Farmer’s case, ‘work’ is more a verb than a noun; the majority of his works are perpetually in progress, evolving from exhibition to exhibition and even, often, from day to day. Clocks and calendars appear in various guises throughout this survey — life, of course, is ordered by time. The first piece encountered, Four Frankensteins (2015), is a site-specific installation in the gallery’s rotunda that collapses the building’s current function with its original — a courthouse where Farmer’s father happened to work as a prosecutor. A drama of four animatronic figures loosely restages the murder of alcoholic architect Francis Rattenbury; the suicide of his wife, singer Alma Pakenham; and the trial of her 18 year old lover, their chauffeur, who was convicted of the killing. The figures are rudimentary, composed of a mere handful of props, and their identities are suggested iconographically. The Judge, for instance, is represented by a gavel and by a clock that is bereft of hands, but which spins periodically and at varying speeds as Alma’s piano recordings play in the background and weapons are slowly raised and lowered. An organizational impulse appears in the painted backdrops, which depict records shelved according to composer and genre. Considering the scandal caused by the Rattenburys’ affair, marriage, divorce, and murder, the piece readily reads as an allegory that pits art and love against propriety and law, a confrontation in which the former are annihilated. And yet, as the brightly painted, bulbous lights that blink on each of the Frankensteins remind us of how easily pathos slips into bathos. These awkward monsters are pieced together not only with disparate physical components, but also selective social memories. It is Storeroom Overture (2015), however, that figures as the formal beginning of the exhibition. A room containing haphazard collections of theatre props, books from the gallery’s library and archive, and some of the artist’s own earlier works, creates a ‘staging’ space in which a multitude of objects that could be organized and catalogued patently are not. A text, which hangs near the entryway, speaks of the necessity of punctuating the vastness of existence, and makes a case for how “beginnings and endings are essentially one and the same.” This becomes a literal truth when the final installation of the exhibition disgorges visitors through a curtain back into this ‘overture’. The Last Two Million Years (2007) is very close in genre to Leaves of Grass. It, too, is a painstaking arrangement of cutouts from a publication. Farmer found the titular volume lying on the street, and in his hands its once chronological images have been released from their binding and positioned in countless new relationships to one another, as if history itself were a thing to be shaken and allowed to resettle. (And who’s to say it’s not?) 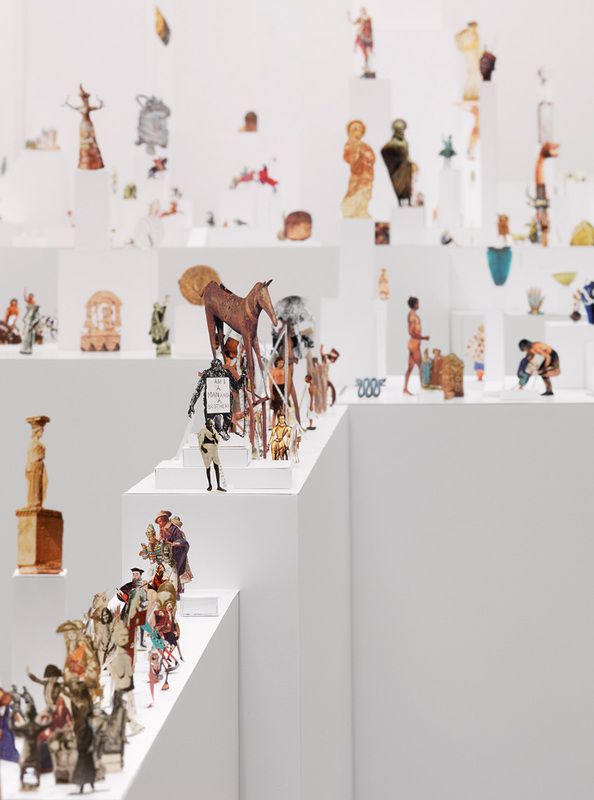 An architectural conglomeration of plinths is covered with minuscule, seemingly endless tableaux in which relative scale is as arbitrary as time: a dragon-like ornament challenges a stone soldier plucked from an unrecognizable army; insular figures enjoy moments of contemplation; in one vignette the Venus of Willendorf towers over clustered battles and fraught civic gatherings, while a Nazi officer standing at Hitler’s side appears to salute her. Things of a kind—quadrupeds, buildings, vessels—tend to be grouped together. Every moment is superbly thought out. To our tenuous contemporary attention spans, it hardly seems possible to look at everything, let alone to have created it. Grouped as a vast sculpture of ephemera they strike us simultaneously with their vivid presence and their transient insignificance, a tension that invokes something of Milan Kundera’s Unbearable Lightness of Being. 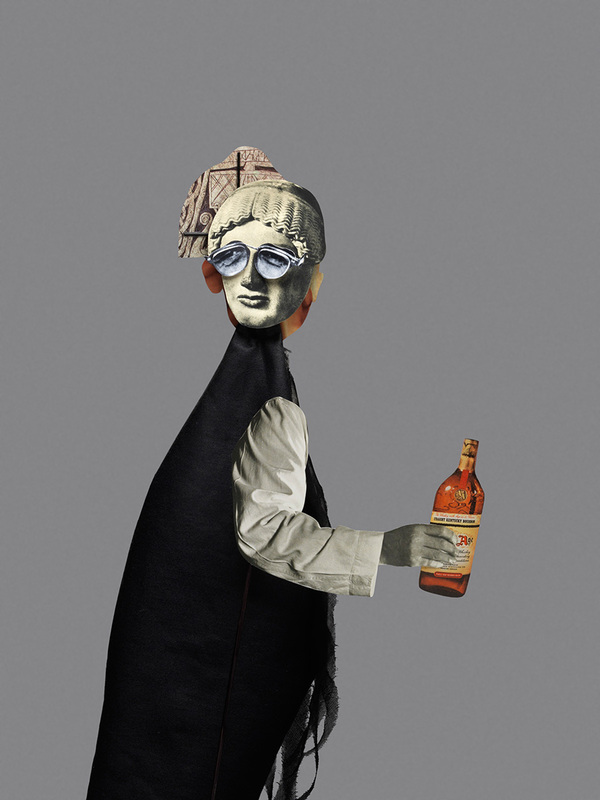 Part of the Vancouver Art Gallery’s permanent collection, the 365 paper cutting and fabric ‘puppets’ from The Surgeon and the Photographer (2009) were last exhibited almost as a procession in 2013 at the London Barbican’s architecturally imposing Curve gallery. They are now gathered together closely in a small room of neutral hues — a carnivalesque flock come home to roost. On the way in you can pick up a volume of 365 ordered texts corresponding to the numbered figures. Sometimes the relationships between object and text are evident, other times wholly mysterious, yet nonetheless loaded with significance, imbuing the small actors with additional layers of distinct personality. The puppets are not numerically arranged, so a substantial amount of flipping back and forth through the book is required to track down the annotations, and if you happen to glance at a phrase you find compelling, you’ll need either a great deal of luck or a great deal of diligence to track down its associated figure. The process of looking them up can become addictive, and as gallery visitors we are again confronted with the impossibility (or at least implausibility) of experiencing the piece in its entirety. The puppets themselves appear both ageless and timeless, spliced together, as they are, from images throughout history. Like The Last Two Million Years, Farmer’s new video work, Look in my face; my name is Might-have-been; I am also called No-more, Too-late, Farewell (2013) takes clippings from history and groups them together based on criteria other than temporal proximity. Here, a computer algorithm matches up images and sounds drawn from massive banks, guided by “objective and subjective” tags the artist has assigned to them. For a few moments there might be a concentration of pictures of feet and percussive sounds; soon after, fragments of brass music accompany various cyclists. It is a continuous flow; Farmer has called it a fountain. The matches will constantly be reshuffled for as long as the piece is turned on and none of the sequences will ever be repeated. This is, in fact, an artwork with no end. The final piece in the exhibition, Let’s Make the Water Turn Black (2013–15), feels like a more developed version of another piece included in this survey, And Finally the Street Becomes the Main Character (2005–08). Both works essentially turn bric-a-brac — physical and sonic — into theatre, using relocated sound in experimental composition. Though they are also both overtly concerned with time, And Finally the Street… functions more directly as a clock. Noises that Farmer recorded in an alleyway outside his studio dart amongst various stools, cans, cardboard boxes, and detritus, staging a day in the life of a downtown street. Certain sounds occur at specific times, and the piece plays on even when the gallery is closed. Let’s Make the Water Turn Black takes a human lifespan as its structuring device, specifically that of Frank Zappa. Featuring a far greater number and complexity of figures and sounds, the piece employs algorithmic programming to ensure that their movements are different every day. Regardless, the choreography will always correspond to chronological events in Zappa’s life, which, here, begins again every morning when the gallery opens and ends with his death at the moment the gallery closes. Farmer’s sound work tends to draw comparisons with Janet Cardiff and George Miller, but beyond their different aesthetics, there is a unique precision to Cardiff and Miller’s pieces, even at their most dramatic. Though you may feel disoriented,the effects are highly controlled. Farmer’s work relates just as strongly Mike Nelson’s, where hints of animism scurry like electrical pulses throughout gathered detritus. With How Do I Fit This Ghost in My Mouth, you might at one moment see an entity with a particular character, but the next it might be just a dingy towel and a light bulb, a few scraps of paper and cloth. There is a constant flicker between conceiving things as subjects or objects. Farmer has referred to himself as an “arranger,” a designation that shies away from the social status afforded terms like “artist” or “curator,” which could be an acknowledgement of the limits of artistic control. The effect of an artwork extends far beyond its creator, who perhaps has merely provided the opportunity for a capricious instant of significance to arise in the mind of a viewer. Trailer (2002), a 28-foot, self-made, film set prop truck, stands out in this way. It is by far biggest singular object and the most directly representational. The piece arose from Farmer’s repressed memory of witnessing a truck fatally run over an elderly woman on his way to class at the San Francisco Art Institute in 1990. It sits alongside the other works as an anomaly, but also with a nagging resonance. We are born, and at some time — any time — we will die. In between there is so much to make sense of. Farmer’s themes are really big—time, life, beginnings, endings — and, as such, they could easily lead to mawkish art. But, the unpredictable complexity that emerges from the sheer volume of diligently arranged components ensures that his works are never shallow propositions. Kyra Kordoski is writer based on the Canadian West Coast. Her work has been published in several arts publications, including C Magazine, White Fungus, BOMB, and Paperwork Magazine.